Export log prices continued to recover in July, increasing around $6/JAS m³. On average domestic pruned log prices increased $3/tonne, structural log prices decreased $1/tonne and pulp log prices were flat. In general, the market situation in July is little changed from that in June. This report, whilst still providing the usual prices and indices, will also discuss the large harvesting volumes forecast over the next decade or so from forests planted in the 1990s. This huge increase in wood availability will have significant consequences for forest owners in terms of the log market and procurement of logging, engineering and log transport capacity. The Chinese log market hasn't changed much since last month's report. High log stocks in China are struggling to reduce much below 4 million m³ and CFR price is struggling to recover. The July increase in the New Zealand at wharf gate price was largely driven by the falling NZ$:US$ cross rate which was above 0.685 in June, fell to 0.675 at the beginning of July and is currently around 0.655. The recovery in the housing market in China is not yet flowing through to sufficient new construction projects to clear the high log stocks and is being hampered by excess housing stock in second and third tier cities. The Indian market is improving with higher CFR pricing offsetting the higher ocean freight rates to India. Currently the India market is offering higher New Zealand at wharf gate prices, but this can change quickly as this relatively small softwood log market can weaken quickly if over-supplied. Affinity Shipbrokers' Baltic Exchange Handysize Index has increased from 345 mid-June to 417 mid-July, an increase of 17%. 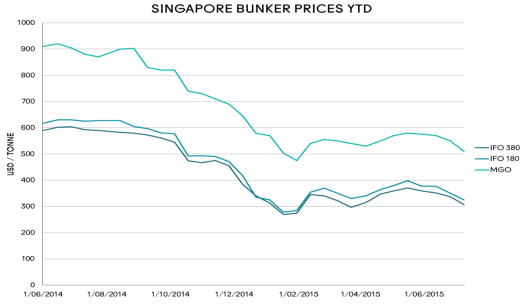 Bunkers (fuel oil for log ships) on the other hand has been trending down again (see chart below) and, since bunkers comprise a significant proportion of total ocean freight costs, this is offsetting the impact of the increased charter rates. On balance, shippers are reporting a slight firming in ocean freight rates for logs, but still in the low USD 20-25/JAS m³ range for favourable schedules. Declining New Zealand GDP growth and an oversupply of structural lumber led to a slight easing in structural log prices in July. This is not considered a change in the general strength of this market segment based on continued strong new house construction levels. The pruned log market remained strong with an average $3/tonne price increase. The current premium for pruned logs (over unpruned logs) is now $70 and could well increase. Forest owners should note that this premium makes pruning financially viable in most situations (and very worthwhile on certain sites). 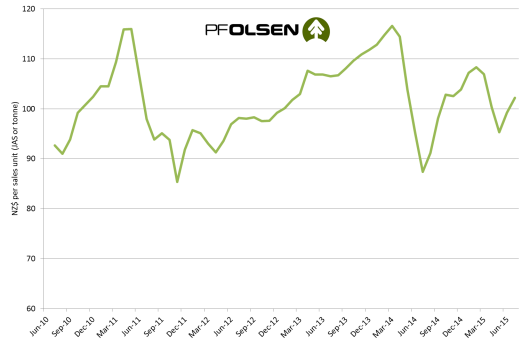 The PF Olsen log price index rose three points from $99 last month to $102 this month. It is now $17 higher than its cyclical low of $85 in November 2011 and $4 below the two-year average and $1 above the five-year average.